There are some forecast issues regarding today’s model runs. No question that the model runs are colder especially this model which is enhancing the idea of faster secondary development. The issue will be how soon that coastal low takes over and the primary low disappears. 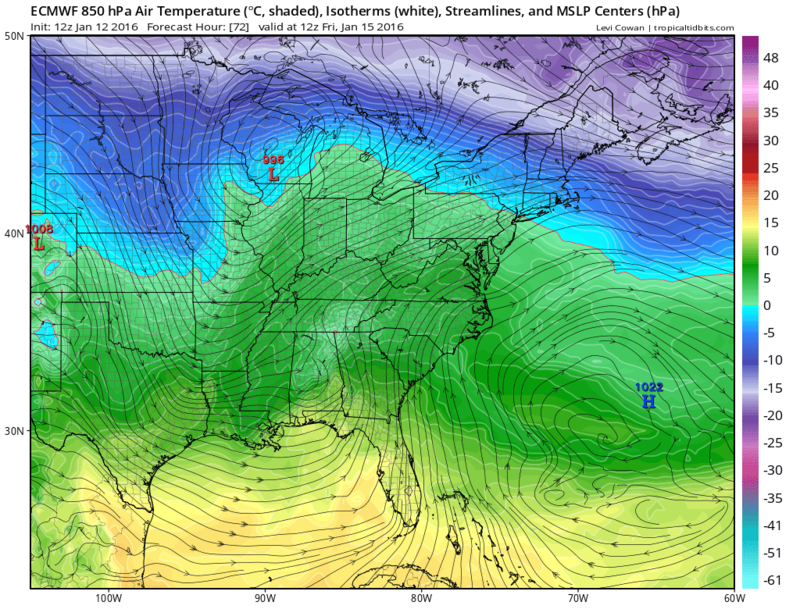 The reason this is important is that the primary low is responsible for pulling up warm air northward. Without a strong enough block you can’t hold on to cold air for the initial shot of precipitation that arrives Friday night. This first map is the European temperatures at the 5000 ft level which is a level that we use to see the advection or movement of cold air and warm air. You can see the southwest winds aloft ahead of this because of where the primary lows is indicated. The zero degree line Friday morning is already to New York City and moving northward. This means that the upper air is just to warm to support anything other than rain for the bulk of the precipitation event. Now we move to Saturday morning. The low is strengthening south of Long Island and East of New Jersey. Notice that by this time frame the Zero degree line is north of the coast but not that far north. Now given that the primary low is completely gone and its just the intense secondary that is now the main storm, the question is whether that zero degree line collapses southeastward. The second question is whether that line collapses fast enough before precipitation ends. I think it is possible that inland of the coast there could be a change to snow before it ends. In fact that change could extend to the coast as well. 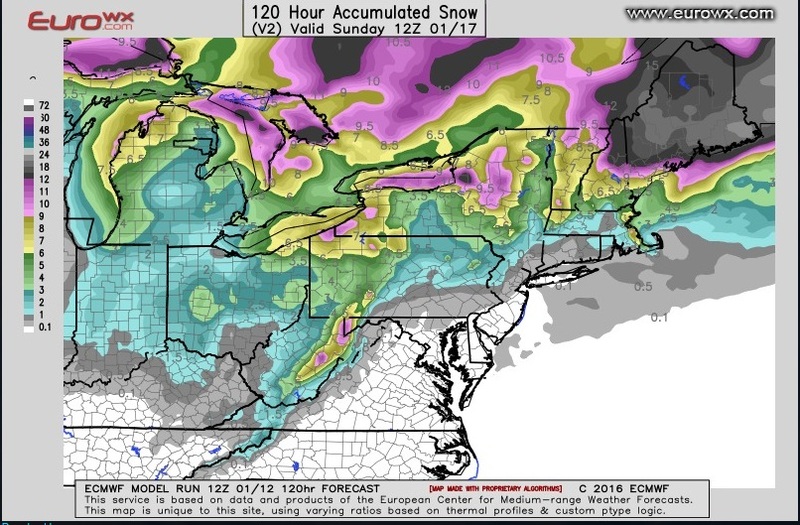 So it may become an issue of how much precipitation is still going on into Saturday afternoon that will determine what we are dealing with here. This is something that cannot be evaluated at this point. Sometimes precipitation shuts off before the cold air arrives and sometimes it doesn’t. It is a tricky forecasting dilemma if it materializes. The models seem very consistent with this idea. Even the Gfs model today opens the door to this possibility. I always have an open mind when it comes to these things. In the end this is still going to be a primary rain event for the coastal areas up to at least route 84. Between 84 and 90 the forecast becomes a dicey issue given the colder look and the more developed coastal low. Here is the European snowfall map through Saturday evening. 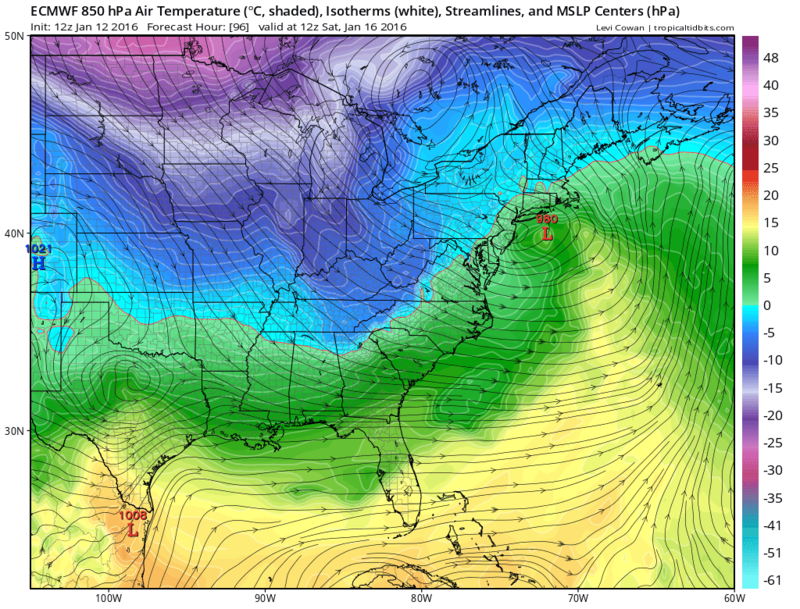 Notice that even with the collapsing cold air there isn’t much shown for the coast. Either way the noreaster threat grows for Friday night and Saturday and there will be coastal flooding and beach erosion issues developing with this along with strong winds and heavy rains along the coast. Here is my midday GFS model analysis.